Anyway, my brother Anthony, a.k.a. Opal Phoenix of The Opal Phoenix Nest, decided to troll me this season. Hard. In the most amazing. Way. Possible. So, fast forward to Christmas morning. I unwrap the present and it is a plain cardboard box. Inside the box is nothing but my Christmas card. As I look at my brother in mock rage, he begins to laugh. 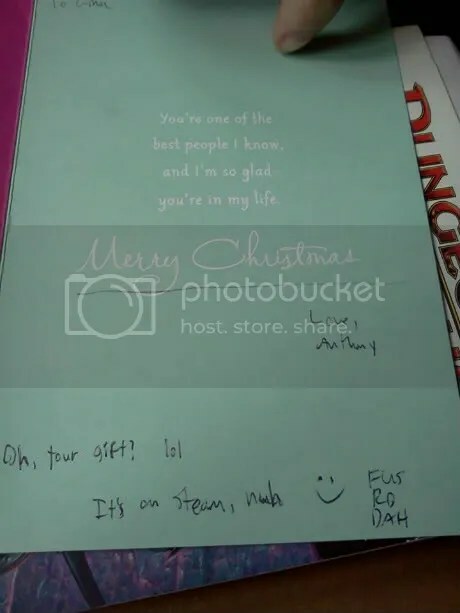 I picked up the card and opened it, and this is what I found. I immediately tackled him with hugs and kisses, squeeling like a little girl. My brother bought me Skyrim!!!!!!!!!!!!!!!! So, I played it for the first time last night, and suffice to say, my entire life is over. It was nice knowing you all and stuff, but I have epic quests to embark on. Ha ha! That was a well done surprise. Enjoy your gift and try not to take an arrow in the knee. My brother is a master troll LOL. Thanks, I’m loving it already! Can’t go wrong with a Skyrim suprise. Sounds like you’ll have your hands full for a while.